Book NOW: Incredibly Low Airfare to Hong Kong, Abu Dhabi, & More! I don’t know how long this will last but there are great deals on Etihad Airways flights. You could fly from New York to Hong Kong for ~$373. Or Chicago to Abu Dhabi for ~$211. There are also great deals flying from the west coast. And from Dallas to Mumbai. Using Orbitz, You Could Book a Round-Trip Flight From New York City to Hong Kong for Under $400 on Etihad! I’ll explain how to book these fares! Folks on Flyertalk have reported success finding very low fares on Etihad. 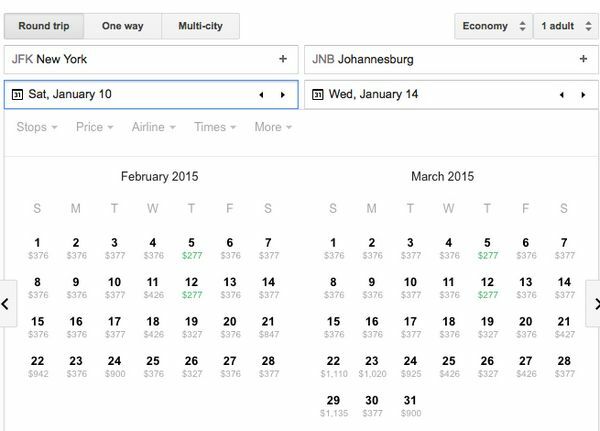 One example was New York City (JFK) to Johannesburg (JNB) round-trip for ~$276 in March 2015. Safari in South Africa This Winter for Under $300 Round-Trip on Etihad! These deals from New York to Johannesburg are also available in other months. 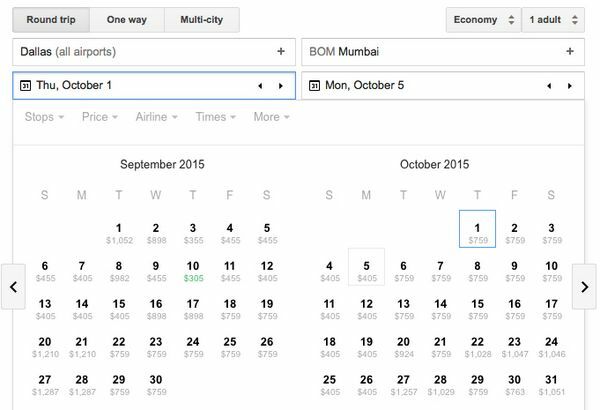 You can use Google Flights to see a calendar with prices. Here’s my post for how to search airfare using Google Flights. 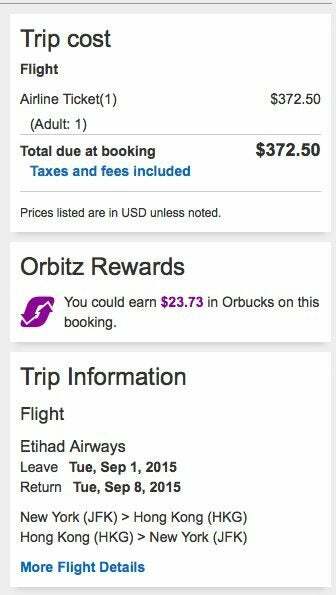 Remember when you book on Orbitz you have 24 hours to cancel for free. So you can find a flight you like, book it, then continue searching for a better flight. Note: Do NOT expect to earn miles in US-based programs like American Airlines. You should book this quickly. Low fares don’t last long. But, do NOT book non-refundable hotel or other travel plans until you receive a confirmation WITH an e-ticket number. And remember: DO NOT call the airline! Don’t forget to use your Chase Sapphire Preferred (which earns 2X points on travel) or Barclaycard Arrival Plus World Elite Mastercard (which earns 2.1% back on travel). There’s nothing better than finding a low fare and getting bonus points for the ticket! There are great deals on Etihad flights right now. I don’t how long this will last! Use Google Flights to search for trips. Then book using Orbitz to take advantage of their 24 hour cancelation policy. Let me know if you book a flight! Got 5 r/t NYC/Abu Dhabi for $177 each!!! I booked 2 tickets for Chicago to Abu Dhabi connecting through Paris for $345 next September. Anyone have any advice on extending the Paris stopover for a few days? I originally tried to book a multistop trip and that made the price shoot up..